Today’s post is written by Jamey Szalay, a New Horizons graduate student at the University of Colorado Boulder. 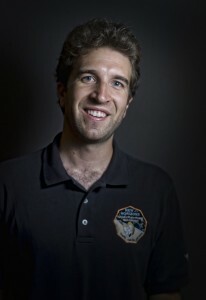 Jamey just completed his PhD at CU and has accepted a postdoc at SwRI to work on NASA’s next New Frontiers mission, JUNO, which arrives at Jupiter on July 4, 2016. For the last five and a half years, I’ve worked on the Student Dust Counter (SDC) instrument onboard New Horizons. SDC was the first student designed, built, and operated scientific instrument to travel aboard an interplanetary NASA mission. Working on SDC has been an incredibly rewarding experience. SDC works a bit differently than the rest of the instruments aboard New Horizons. While the principal investigator, Professor Mihaly Horanyi of the University of Colorado, is ultimately responsible for the project, SDC is a student-run instrument. As such, the day-to-day operations are actually handled by graduate students. During the design and build phase of the instrument, the SDC team consisted of about 20-30 undergrad and grad students. Once our team delivered SDC to the spacecraft and launched, the team size was significantly reduced, down to one lead graduate student and one grad student trainee. I inherited the position from Andrew Poppe, the lead before me, and have now passed the torch on to Marcus Piquette, the current SDC instrument lead. Our job has been to maintain the health and safety of the instrument, to be responsible for operating it year in and year out, and perform the scientific analysis once the data is returned to the ground. Even as students, we also represented SDC at all the New Horizons team meetings and we were expected to present at the level of a professional scientist. What an invaluable experience it has been! Not only has SDC pioneered a new kind of student involvement in a NASA mission, we’ve also been able to do some truly groundbreaking science. It turns out the solar system has a dust disk that extends out from near the sun all the way to the Kuiper Belt, and possibly beyond. 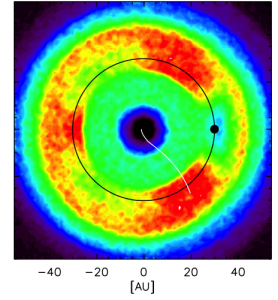 Past Jupiter, this dust disk is comprised of material primarily shed from Kuiper Belt objects. Were an observer to be very far from our solar system, he or she wouldn’t see all the planets orbiting our sun—they would be too faint. Instead, an observer would see our solar system’s dust disk. Figure 1 shows a model of what our own solar system’s disk may look like. As of late 2010, when it passed a distance of 18 AU (1.7 billion miles or 2.7 billion kilometers), SDC became the farthest reaching dust impact detector in history! SDC is bolted on the ‘windshield’ of New Horizons, so to speak, such that dust particles smash into it as the spacecraft transits the solar system. As SDC plunges through our dust disk, we’ve been able to measure and characterize the dust density distribution from Earth to Pluto, and beyond. With this information, not only can we better understand our solar system, but also help unravel the mysteries of countless other solar systems throughout the observable universe. I’m very fortunate to have been involved with New Horizons in such a meaningful way by working on the Student Dust Counter team. Leading a student instrument for five years has truly been a unique experience, allowing me to understand the inner workings of a NASA deep space mission from the inside out. We’re thrilled to have reached Pluto and can’t wait to journey into the heart of the Kuiper Belt to learn what’s out there. Previous Previous post: Rotational Movies of Pluto and Charon: It’s Show Time!